Vogue 1117 (Michael Kors) – I’ve been wanting to make this for a few seasons now, and I have plenty of non-stretch wovens which could become it, but I think a basic grey flannel would get the most wear, and double up for dressier work occasions, too. Style Arc Marita – Ditto have some lush viscose jerseys that would be perfect for this, and winter knit dresses are just so comfortable paired with tights and boots! I bought this pattern this summer but decided to hold off until winter and make this my first Style Arc pattern. Wiksten tank – Kollabora happily gifted me the pattern and the Mood jersey I picked out, and I’m likely to add some sleeves to this to make it more cold weather friendly. Jalie 2908 Jeans – I’m already midway through making these using some stretch denim I bought in Paris earlier this year. I wear my NY-Lon jeans to death and they’re starting to fade and I want to have a replacement pair ready before they totally die! My Image AW12 M1253 – I haven’t officially paired a fabric with this yet, but there are some stretch twills at Ditto I’ve got my eye on, but I need to sew down my stash a little bit first. Burda 09-2012 #134 (Matthew Williamson) – I’ve had a heavyweight, dark plum duchesse satin in my stash for two years and I think this would be the perfect pairing for a classy little sheath dress. Burda 10-2012 #134 – I’ve got two linens in my stash that would work nicely here for a little jacket to wear with any of the three sheath dresses on this plan. I love the vintage line of this coat and how it’d pair with an otherwise slim silhouette. Has anyone made any of these that wants to offer any thumbs up or down? And to keep things interesting, I can reveal that I’ve made two of the above already (I put together the shortlist while in France on holiday). Anyone want to venture a guess which ones? No points for guessing if you already know from my tweets! 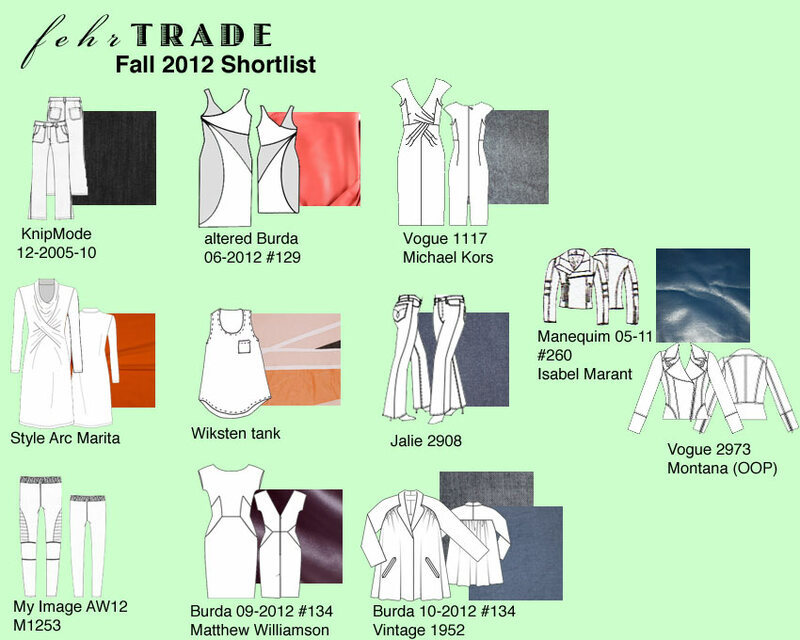 Separator image Posted in In Progress and tagged with bwof, designer, drafting, dress, fw12, jacket, jalie, jeans, knipmode, leather, manequim, myimage, vintage, vogue.